Publication Merkityksestä /From Meaning. A very small and cryptic mystic’s prayer book, not representing any known religion, meditating things that belong to the sphere of non-knowledge: the meaning of humankind, the future of universe, death of religions, and the ultimate ethics. 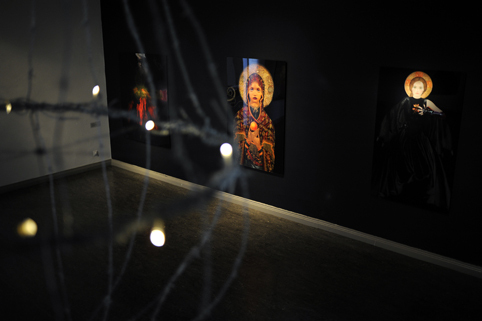 The group exhibition Manifesto of Stillness in the Hyvinkää Art Museum, from 14 December 2018 until 24 February 2019, in the grand hall of the museum. Artists: Ulla Karttunen, Jukka Korkeila, Anni Löppönen, Ville Löppönen and Henry Wuorila-Stenberg. Opening 13th December 2018 at 6pm. Art Below Los Angeles 2018 at Grand Union Station from the 31st October, the exhibition runs for two weeks. Opening at the the Foshay Masonic Lodge, Los Angeles, with a special Halloween Art Party, on 31st October, 2018. 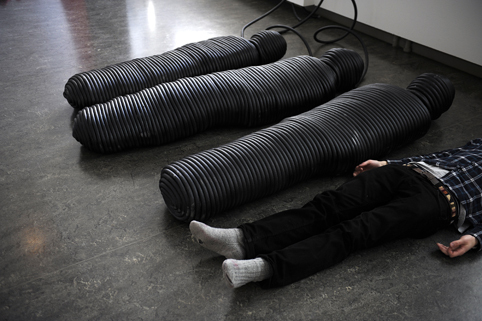 BELA BIENNIAL of European and Latin American Contemporary Art: ’Sustainability’, The Cable Factory, Helsinki, Finland, July 26 – August 12, 2018. Opening reception July 26, 6-8 pm. Los Angeles Center for Digital Art, from June 14 to July 7, 2018. Opening Reception Saturday June 16, 6-9pm. Artbox.project New York 1.0 at Stricoﬀ Gallery in Chelsea, New York, from 5th March to 16th March 2018. Confluences: winners and mentions in the International Contemporary Art Competition Open Art Miami, from December 8th 2017, at the same time of Art Basel Miami, Artium Art Gallery, Miami. 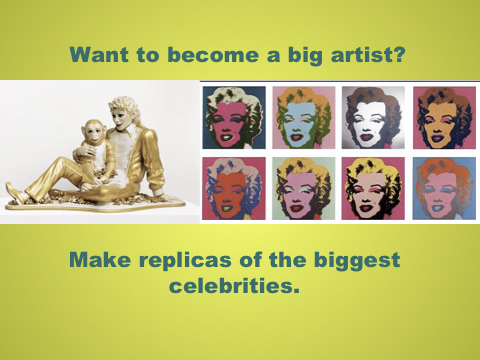 In the contest over 2000 works of art were received, a number that reflects the diversity of the participation of a large group of artists, most of them residents of the United States, Canada, Spain, Austria, Argentina, France, Italy, Japan, Mexico, Brazil, China and Germany, among other nations. Lynx Prize: Finalists and Selected Artists Lokarjeva Galerija, Ajdovšcina, Slovenia. From November 17th to December 2nd, 2017. Ulla Karttunen has been shortlisted for the LYNX Prize 2017 in the digital art section. The jury was composed of 15 professionals and experts, who chose the selected artists from more than 600 works. 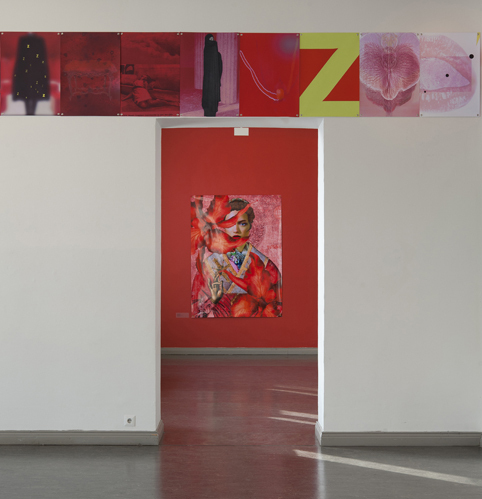 Shortlisted artists’ works will be presented at three exhibitions in Italy and Slovenia. 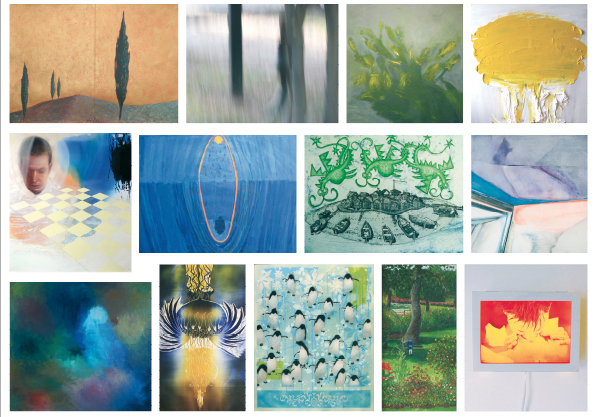 The prize giving ceremony will happen in September ja finalists’ exhibition will be shown at Lux Gallery, Trieste. 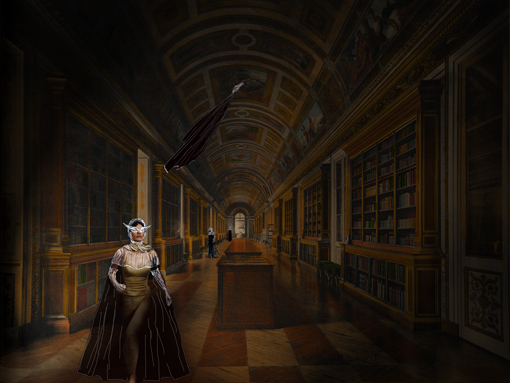 Donna Criminale by Ulla Karttunen has been selected as a finalist in The Malamegi LAB.8 Art Competition. The finalists’ works will be shown in Rome at Loft Gallery from 14th September to 5th October 2017; the exhibition will be accompanied by a catalogue. 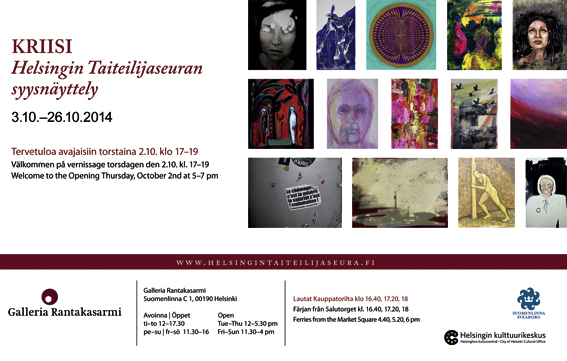 Helsinki Artists’ Society (HTS) celebrates its 50 years and Finland’s 100 years with a juried exhibition Jatkuvuus/Continuity at Malmitalo gallery. 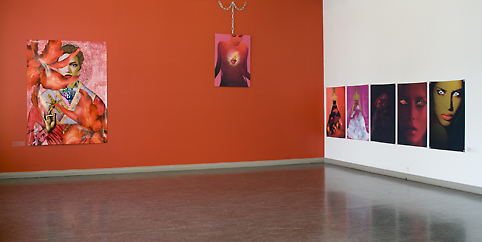 The exhibition runs August 31 – September 23, 2017. Donna Florale, by Ulla Karttunen, was awarded by Honor Mention in Digital Art in The International Contemporary Art Competition 2017, organized by Open Art Miami. Ulla Karttunen was nominated as a finalist in The Digital Art section in the International Contemporary Art Competition 2017, organized by Open Art Miami. 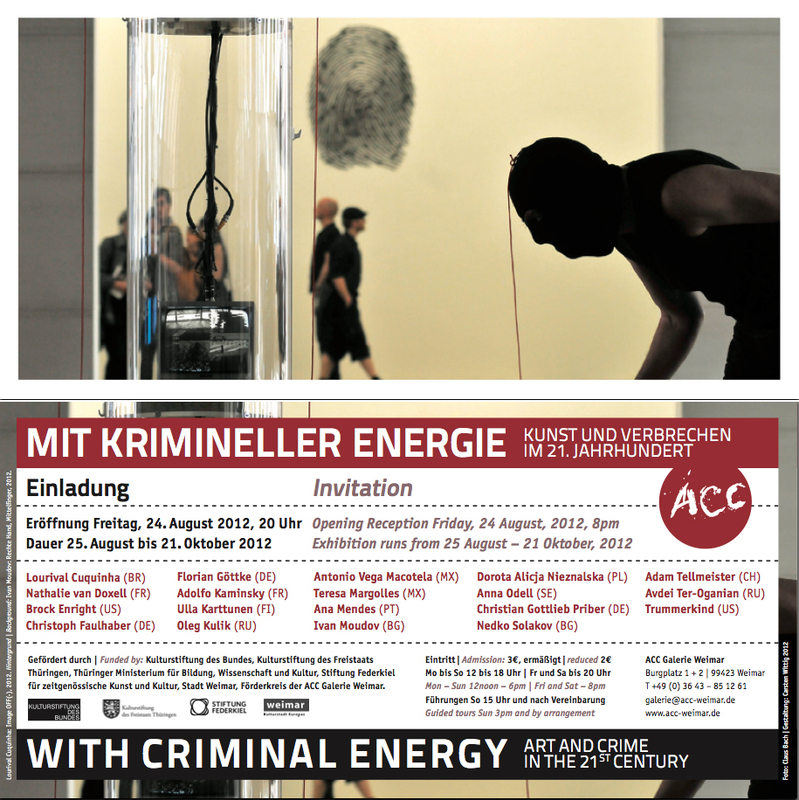 During the ART BASEL WEEK, Donna Criminale by Ulla Karttunen is part of the collective exhibition ARTBOX.PROJECT BASEL 1.0. Event platform Luminator, Euroairport, Swiss side, 14 June – 18 June 2017. Contemporary art fair at Carrousel du Louvre, Paris, 9-11 June 2017, and collective show ARTBOX.PROJECT at Basel artweeks, Eventspace Luminator, Basel 14-18 June 2017; both participated by Ulla Karttunen. 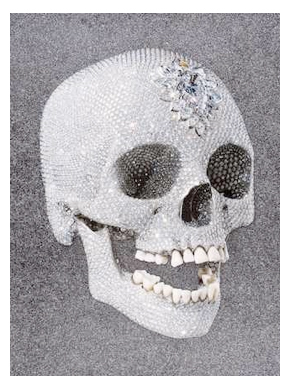 The work shown in Basel is Donna Criminale, and in Paris another evil lady, Donna Florale. Opening 24 May 2017, 6-8 pm, wellcome! Exhibition Art Experience at Galleria Wikiarte, Bologna, Italy, April 22 – May 4th, 2017. 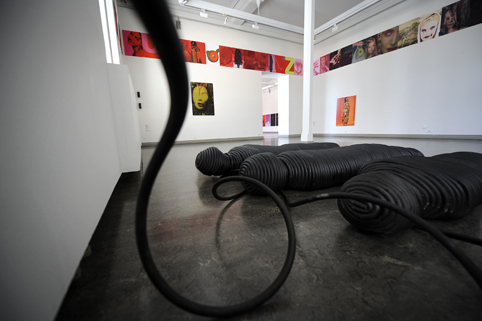 The gallery has an exhibition area of 300 square meters, and hosts the works of contemporary artists. Curator of the exhibition: Deborah Petroni. The event will be presented on the opening night by the art critic and historian Dr. Francesca Bogliolo. The exhibition will also be accompanied by a catalog. Published: Lucian silmät (The eyes of Lucy), a novel by Maaria Oikarinen, publisher Arktinen banaani. 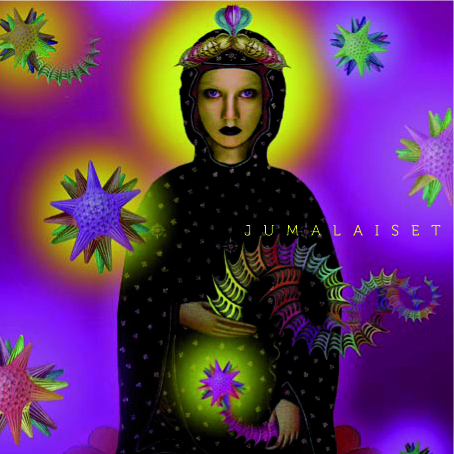 Design by Ulla Karttunen. 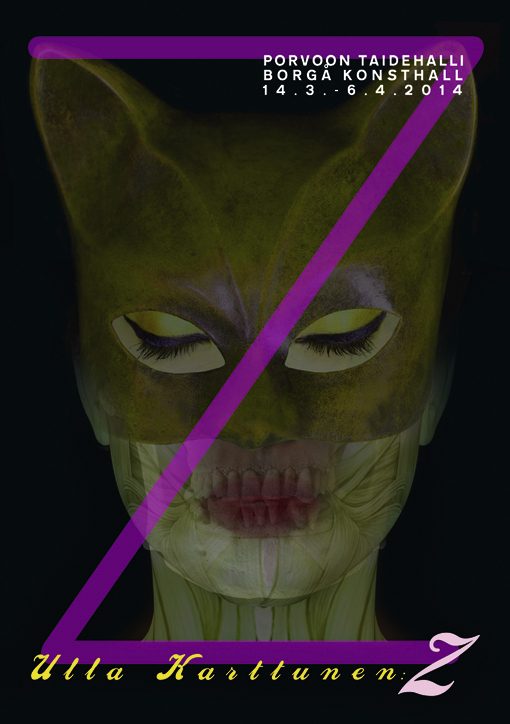 Cover art: Thorn Eye II. Al-Tiba9, international contemporary art exhibition opens 29th September 2016, at Bardo National Museum, Algiers 2016. 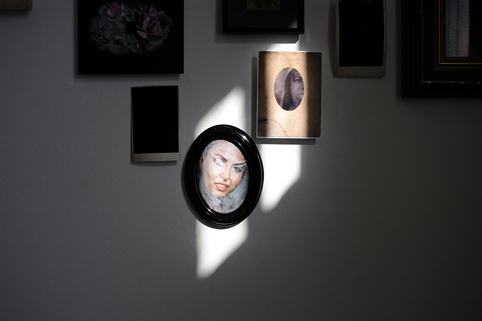 Artists: Amine Aitouche (mural, Algeria), Elena Bellantoni (video, Italy), Giuliana Bellini (installation, Italy), Amel Benmohamed (photography, Algeria), Claudio Burei (installation, Italy), Albert Coma Bau (painting installation, Spain), Mounir Fatmi (installation, mural, photography, Maroc), Valentina Fernandez (video, Germany & Italy), Hind Faiza (photography, Algeria), Ulla Karttunen (installation, Finland). Winner, Best Project, Ulla Karttunen, Donna Criminale. Winner, Best Single Work, Steve Salo, Grief. 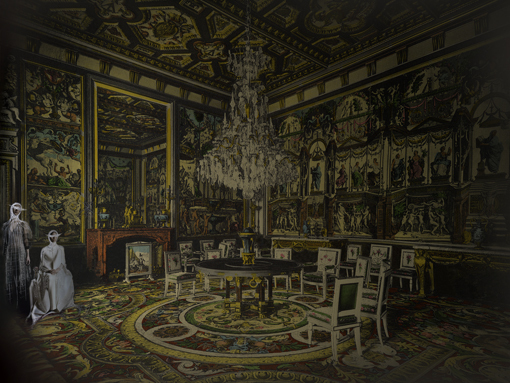 The exhibition continues until 29 April at Galleria Poggiali & Forconi in Florence. Voittajat valittiin Taboo-kilvan finalistien näyttelyn avajaisissa: Voittaja, paras taideprojekti, Ulla Karttunen, Donna Criminale. Voittaja, paras yksittäinen teos, Steve Salo, Grief. Näyttely jatkuu Galleria Poggiali & Forconissa Firenzessä 29. huhtikuuta 2016 saakka. Prizegiving at Thursday 21 April 2016 at 7 pm. Selection of the 10 finalist works and 3 projects was made by the directors of the Galleria Poggiali e Forconi. 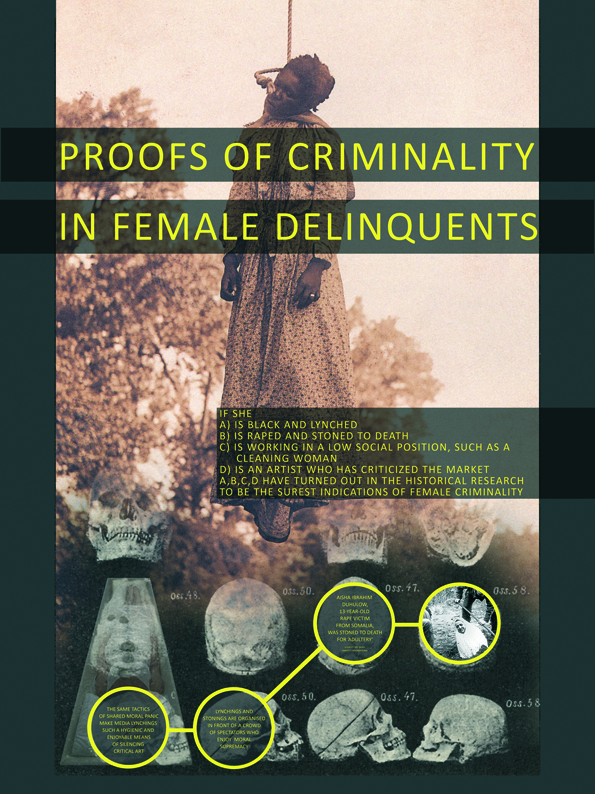 Works were selected ”for their ability to spark thoughtful investigation on taboos”. Prizes will be voted by the finalist artists themselves on the awards night. Hiljaisuus ymmärretään monesti hyvin kapeasti puhumattomuutena tai äänettömyytenä. Hiljaisuus kuitenkin avaa oven kuulemisen ja näkemisen aloihin sekä kokemiseen, missä voi tapahtua kohtaaminen, läsnäolo ja yhteys Toiseen. Hiljaisuuden manifesti kokoaa yhteen viisi taiteilijaa, joille hiljaisuus on keskeinen asia taiteen tekemisen tiellä. Hiljaisuus on kutsu sanattoman äärelle, sisäisten kuvien ja kokemusten läpäisevyyteen. Avajaiset lauantaina 9.huhtikuuta 2016 klo 18.00, tervetuloa! This is just a bookmark. 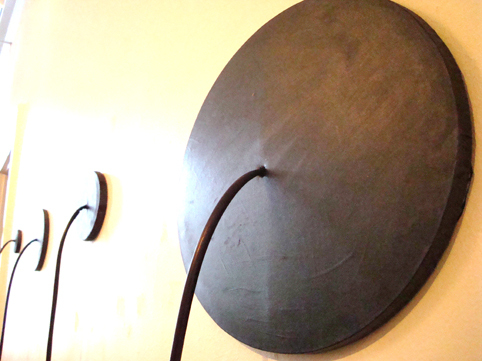 Delivered at PAF, by artist Ulla Karttunen. Näyttelytapahtuma 5000m2 Lappeenrannan vanhassa teatteritalossa. Yli 100 kuvataiteilijaa on rakentanut teoksensa varten vasten tilaan, purettavaan teatteritaloon. 111 teoskokonaisuutta: graffiteja, muraaleja, installaatioita, veistoksia, videoita, maalauksia. 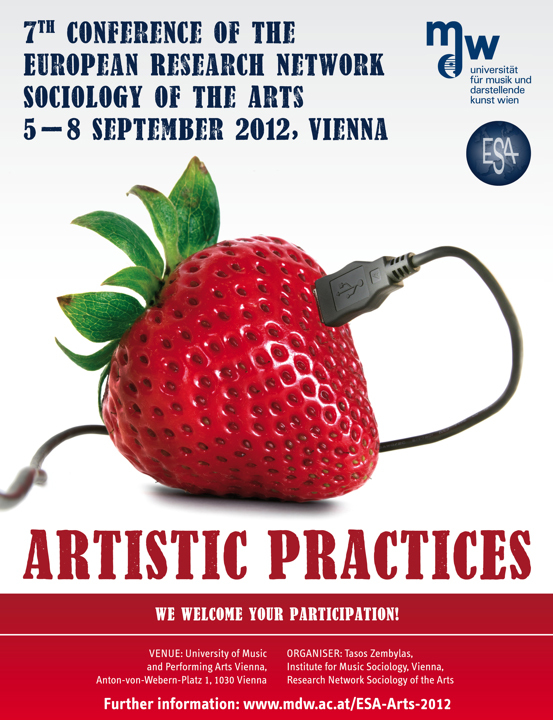 Differences, Inequalities and Sociological Imagination, 12th Conference of the European Sociological Association 2015, Prague 25-28.8. Ah!Jo! Katsaus Itä-Suomen nykytaiteeseen. Taidekeskus Ahjo ja Joensuun taidemuseo Onni 26.3. -17.5.2015. Avoinna ti, to-su 11-16, ke 11-20. Näyttelyn ovat koonneet Ulla Jokisalo ja Reijo Kela. 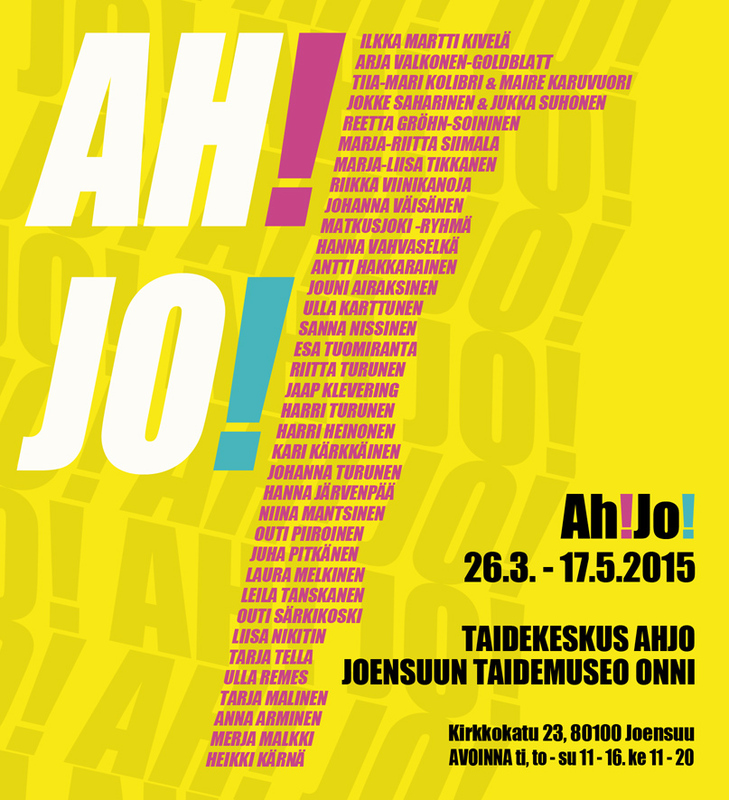 Näyttelyn avajaiset 25.3. kello 18-20 Taidemuseo Onnissa, jatkot Ahjossa, esiintymässä Outo Lintu. Tervetuloa! Taiteilijoina mm. Akseli Gallen-Kallela, Emil Halonen, Wäinö Aaltonen, Essi Renvall, Jyrki Puhakka, Reetta Gröhn-Soininen, Heidi Vasara, Liisa Nikitin, Ulla Karttunen, Jan Neva. Kiteen uuden terveyskeskuksen viralliset avajaiset ovat piha- ja viimeistelytöiden valmistuttua vuonna 2015, mutta talo on jo käytössä. 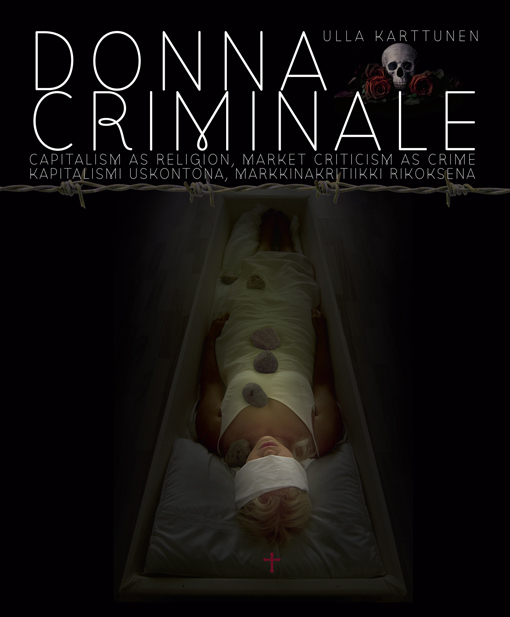 The book Donna Criminale is available at the Porvoo Art Hall exhibition Z, with special price 20,- €. Kirjaa saatavana Porvoon taidehallista Z-näyttelyn ajan erikoishintaan 20,- €. From Porvoo Art Hall Shop also earlier books: ”Ulla Karttunen, A Modern Mystic ” (Publications of the Joensuu Art museum 1/2011) and ”L’Amour et La Mort / Invisible Book” (2009). Avajaiset pe 27.9. klo 19-21, tervetuloa! M4: Greifwalder Str. / Danziger Str. 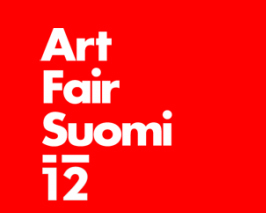 Art Fair Suomi 12 presents works e.g. 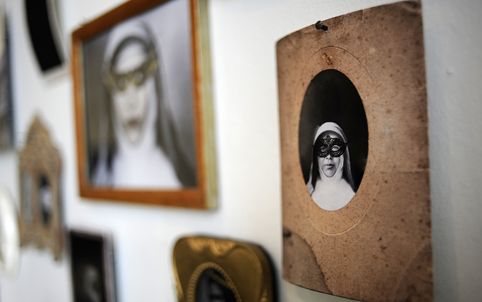 from Ulla Karttunen’s series Capitalism as Religion and Blindfold. 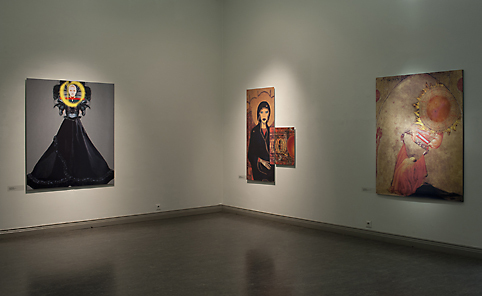 Larger samples from both series exhibited in ACC galerie, Weimar, Germany, untill the end of October 2012. Art Fair Suomi 12:ssa esillä mm. 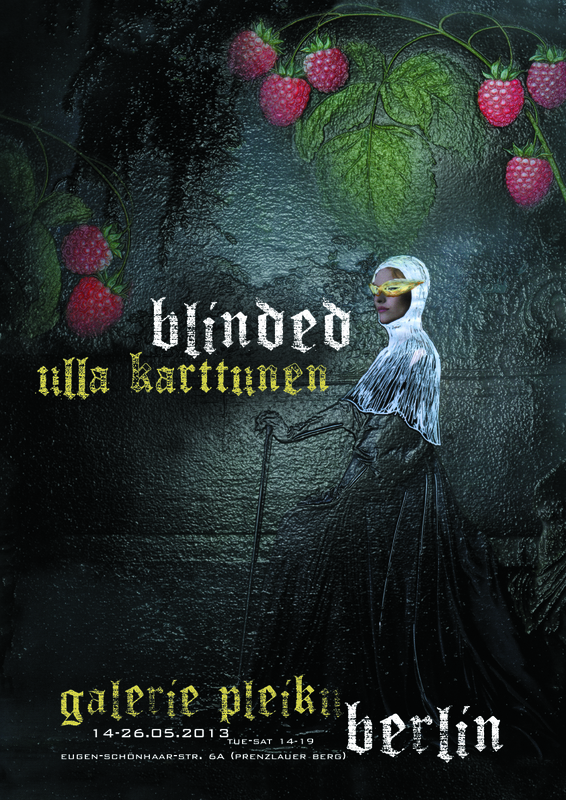 teoksia Ulla Karttusen sarjoista Kapitalismi uskontona ja Blindfold. Saman sarjan teoksia laajemmin par’aikaa nähtävillä ACC-galleriassa Weimarissa Saksassa. The concept of practice differs from the classical concept of action. Practice is located in a community of practice and it should be analysed on the basis of its embeddedness in social structures and cultural dynamics. This theoretical conception also transforms our understanding of other theoretical concepts such as knowledge, intention, meaning, institution, rule, structure, and power. Practice theory, praxeology, interaction theory and discourse theory, ethnomethodology have elaborated different theoretical and methodological approaches for the analysis and empirical research of various practices, however artistic practices have rarely been explicitlyfocused on. Artistic practices as arrays of specific activities assume theoretical knowledge as well as know-how, that is to say connoisseurship but also practical abilities and skills. 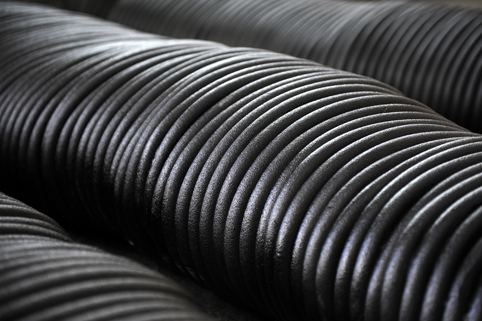 Artistic practices are developed practically and collectively in collaborative networks. They are pre-structured by conventions, institutions, regimes of competence, forms or alignments of power, and technological and financial means, although practices themselves instigate the formation of these various structural parameters. 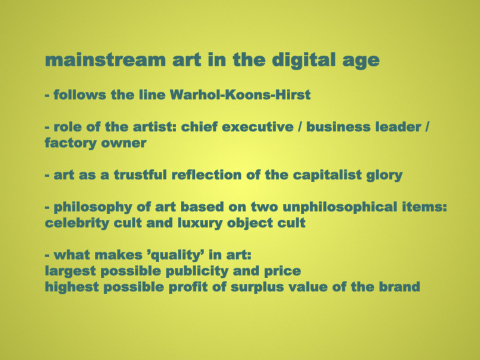 *what could be art, and the politics of art, in the age of digital reproduction? 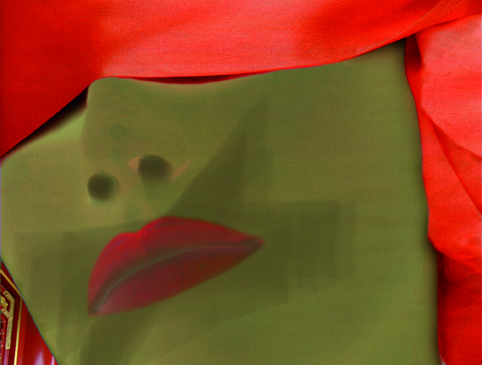 *is there a place for controversial art in our dreamy universe of seduction and fulfillment? 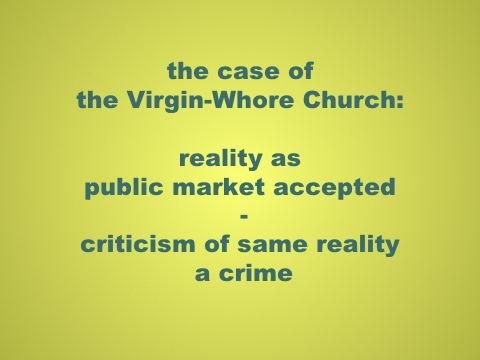 Ulla Karttunen’s installation Donna Criminale: Capitalism as Religion, Market Criticism as Crime (2012), was with its thousand square meters biggest in Halle 14:s history. It experienced a thorough transformation to be able to move to a Baroque room in Goethe’s first residence in Weimar, where contemporary art gallery ACC is situated. 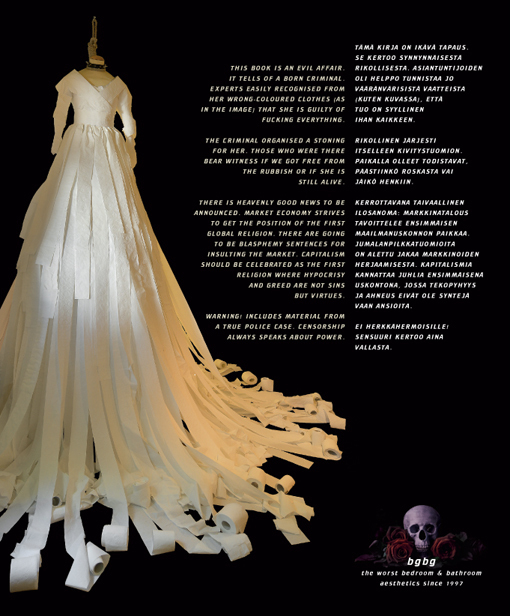 Exhibited banalities in extreme: a still more sublime version of a hanged toilet paper bride and the merits of Finnish art museum bosses as the successors of criminologist Cesare Lombroso. Leipzigin Halle 14:n tuhannen neliön installaatio Donna Criminale: kapitalismi uskontona, markkinakritiikki rikoksena on kokenut radikaalin transformaation siirtyäkseen barokkihuoneeseen Goethen ensimmäiseen Weimarin asuintaloon, jossa ACC-galleria sijaitsee. Esillä banaliteettien äärimmäisyyksiä: entistäkin subliimimpi versio hirtetystä vessapaperimorsiamesta sekä suomalaisten museonjohtajien ansioita kriminologi Cesare Lombroson työn jatkajina. 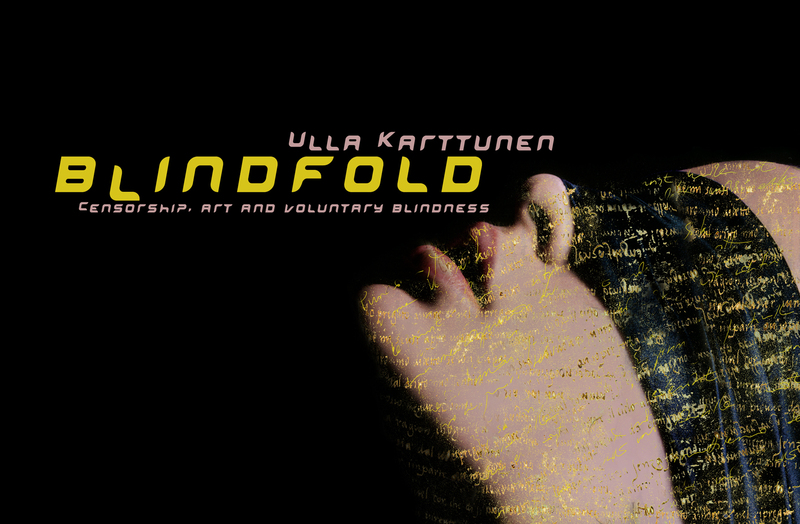 BLINDFOLD, private exhibition by Ulla Karttunen, Gallery Alkatraz, Ljubljana, 25th November – 9th December 2011. Curator of the project: Dr. Mojca Puncer. Organisers: Alkatraz Galerija & Horizonti, Institute for Art, Culture, Science and Education. 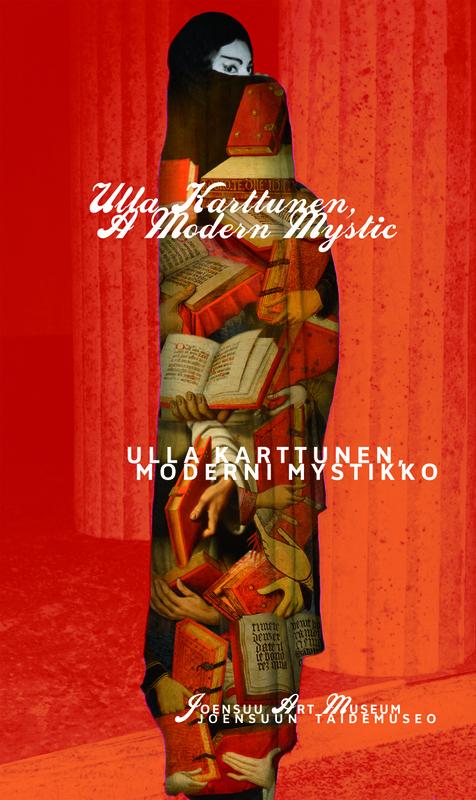 A book published: Ulla Karttunen, A Modern Mystic. 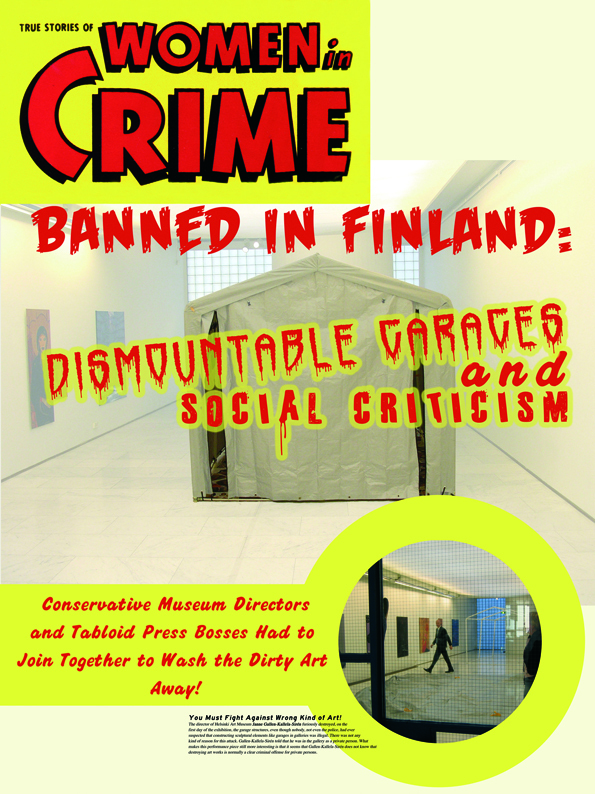 Publications of the Joensuu Art Museum 1/2011. Texts: Sofia Escudero, Maaria Oikarinen, Ulla Pennanen, Elina Vuola, Johanna Westersund, Ulla Karttunen. 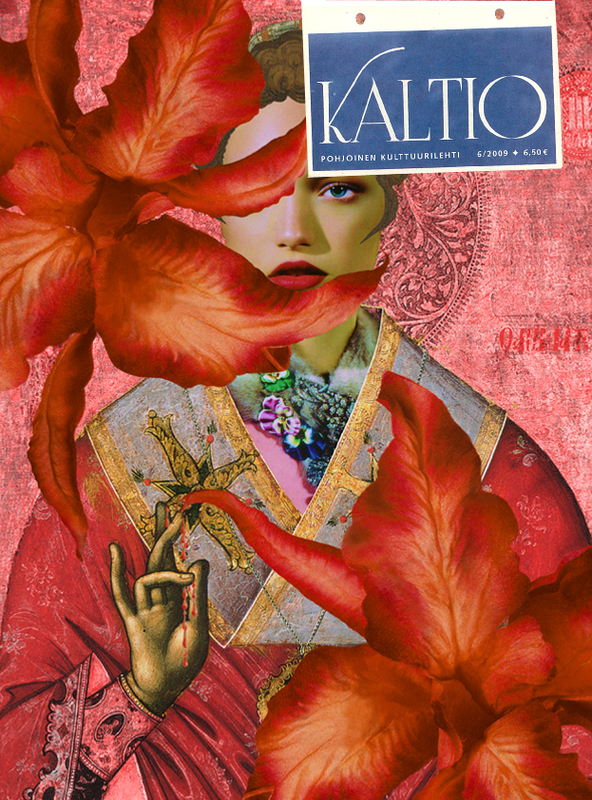 Graphic design & art works: Ulla Karttunen. Languages: English, Finnish. 144 pages, all 4/4 color printed. ISBN 978-951-8971-37-8. Kirja ilmestynyt: Ulla Karttunen, Moderni mystikko. Joensuun taidemuseon julkaisuja 1/2011. Tekstit: Sofia Escudero, Maaria Oikarinen, Ulla Pennanen, Elina Vuola, Johanna Westersund, Ulla Karttunen. Graafinen suunnittelu ja taideteokset: Ulla Karttunen. Kielet: englanti, suomi. 144 sivua, kauttaaltaan väripainettu. 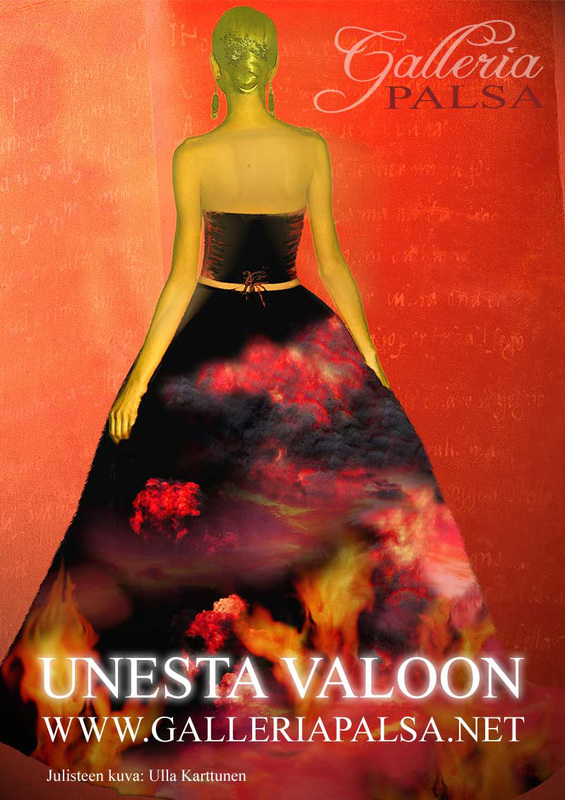 ISBN 978-951-8971-37-8. Kutsunäyttely METSÄSTÄ, Haiharan taidekeskus, Tampere 6-28.8.2011. 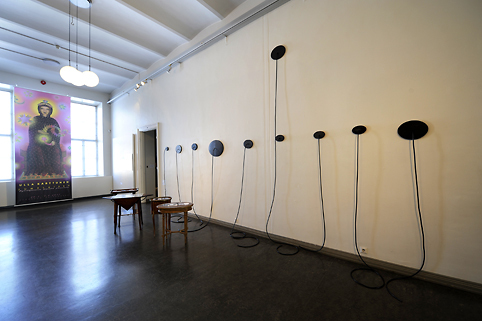 Invitational exhibition FOREST in Haihara Art Center, Tampere 6-28 August, 2011. Sosiologian maailmankongressissa Göteborgissa. 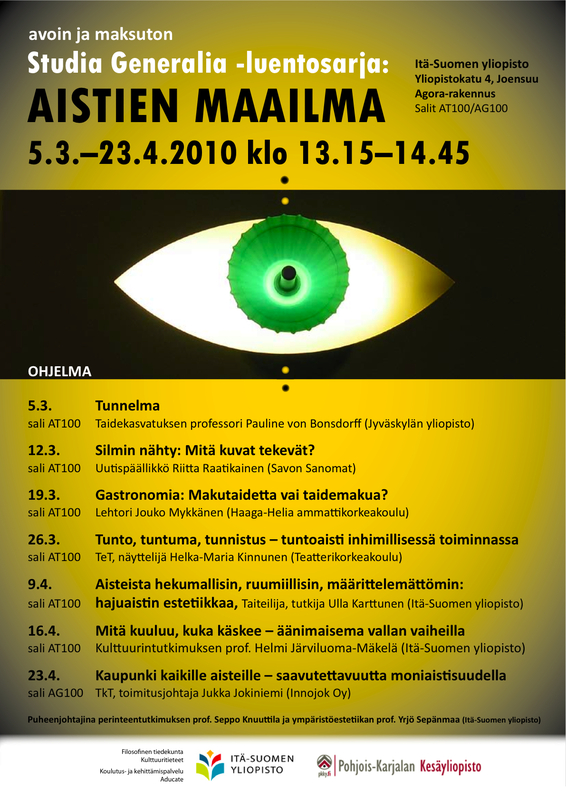 Erkki Seväsen luento ”Contemporary Art as a Criticism and Counterforce of the Prevalent Societal Rationality” käsitteli myös Neitsythuorakirkon tapausta. 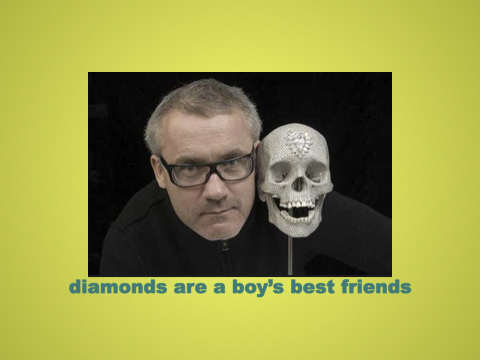 Taiteilija on tämän päivän maailmassa Jeff Koonsin tai Damien Hirstin kaltainen toimitusjohtaja ja luksustuotteiden suunnittelija. Yhteiskunnan ja sen oikeudenmukaisuuden arviointi ei muodosta luksustuotetta, joten sille on vähän tilaa uusliberalistisen hypen luotsaamassa taidemaailmassa. Kuvassa tämän hetken paras ja menestyksekkäin taideteos, Damien Hirstin sadalla miljoonalla myyty For the Love of God –pääkallo. Hirst oli mukana teoksen ostaneessa investointiryhmässä, sillä neuvokas taiteilija kirittää omia hintojaan. Pääkallo ei muistuta meitä tänään kuolemasta, vaan taiteen turhuudesta. 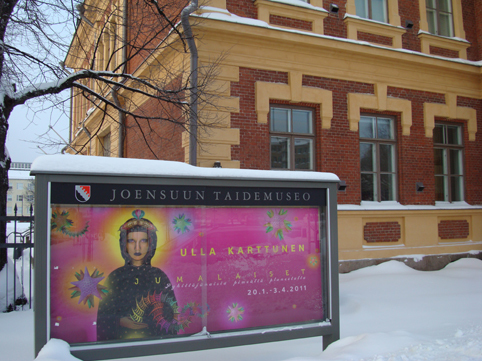 Kuvassa Hirstin teoksestaan tekemä, timanttipölyllä päällystetty serigrafia (”For the Love of God, Laugh”, 2007) Musée Maillolin tämänkeväisestä ”C’est la vie, Vanités” –näyttelystä. Unesta valoon -näyttely avautunut Galleria Palsassa. Taiteilijat: Samuli Kontio, Tuula Nikulainen, Petri Hytönen, Ulla Karttunen, Susanna Majuri, Satu-Maaria Mäkipuro. Taiteilijan sana -teksti kertoo näkyväisestä ja näkymättömästä. Tai uskonnon, tieteen ja taiteen suhteesta pimeään aineeseen. Ulla K on Kaltion ennen joulua ilmestyneen vuodenvaihteen numeron 6/2009 kansitaiteilija. Kansiteos on nimeltään Orkideoiva ja lehdestä löytyy myös Orkideoiva jouluevankeliumi. Karttunen ennustaa, että kohtalokkaat aiheet palaavat taiteeseen viimeistään noin tuhannen vuoden viiveellä.